The iconic Tom Ford Natalia Bag designed with the signature gold turnlock hardware. Crafted in Italy of smooth leather and exclusively available at Harrolds. Winner will receive one Tom Ford Natalia Bag (as pictured) valued at $3,745. Not redeemable for cash. One entry per person. Closing date for entries is 31 January 2019. 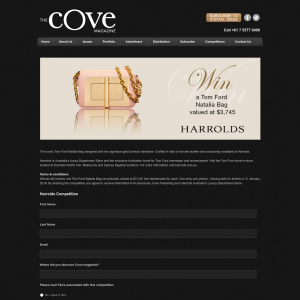 By entering the competition you agree to receive information from Sanctuary Cove Publishing and Harrolds Australia’s Luxury Department Store.